Two ATG prepared Norma M20F sports racers are featured in an article in the March edition of Car & Driver magazine. The cars are featured in a segment called "Bio-Racing – Little Green Racing Machines." Automotive Technology Group (ATG) of Irvine, California, took two normally aspirated, gas powered Norma M20F 2.0 liter sports car and converted them to run on bio-ethanol (a type of E85), resulting in increased horsepower output of 10% while significantly reducing emissions. Both cars ran flawlessly for the full duration of the NASA 25 hour of Thunderhill endurance in Northern California. One of the cars finished 2nd place overall capping off an exciting race where the two E85 powered cars repeatedly reset fast lap of the race. Read the full Car & Driver article. 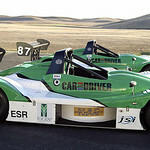 The cars were also featured in the February 2008 issue of Ethanol Producers Magazine in a ten page article that discussed the Thunderhill race and the merits of Bio-Ethanol in race cars. The article titled "Quick off the Straw" has drawn attention from all automotive sectors. Read the full Ethanol Producers Magazine article.